Home » English » Turkish food – what is it? What will you eat? It is quite difficult to ignore Turkey’s participation at the world map, when we speak about food. In fact, there are several who will claim that Turkish food belongs among the 4 greatest like France, Italy and China. If it’s true or not, I’ll not decide. The evidence is overwhelming though (which you probably will not doubt, if you have ever traveled in Turkey). Because off a lot – nearly all – Turkish food originates from when Turkey was more known as the Ottoman Empire, the kitchen is extremely varied and widespread. Remembering that the Ottoman Empire stretched beyond parts of Europe, the Balkans, Persia, the Middle East and all the way through North Africa, is not so mysterious that many of the dishes is recognizable but with different regional variations. For example, you can recognize dishes like kebab, falafel, köfte and Baklava, whether it’s in Croatia, Morocco, Turkey or Lebanon. 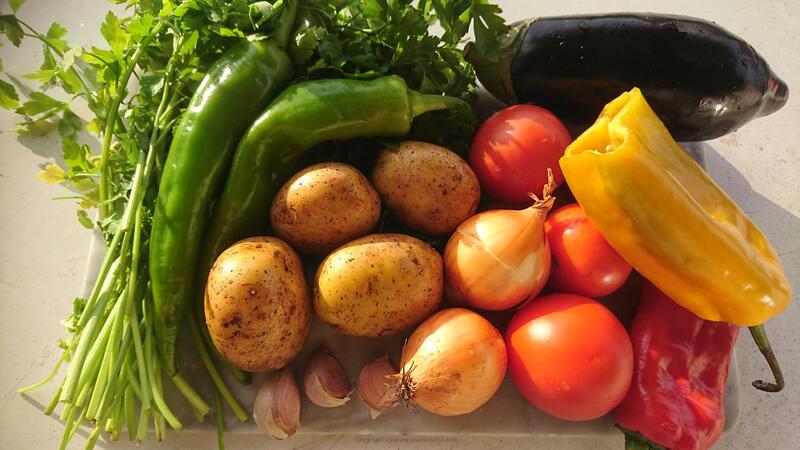 Turkish food consists mainly of vegetables and beans, as these are significantly cheaper than meat (Meat costs significantly more in Turkey than it does in Denmark, for example, compared with the wage level – it is quite expensive). And why not use the best ingredients, when you have them right at your fingertips? Especially vegetables like aubergine, tomatoes, broad-leaved parsley, onion, garlic and lemon are used together with rice and bulgur. 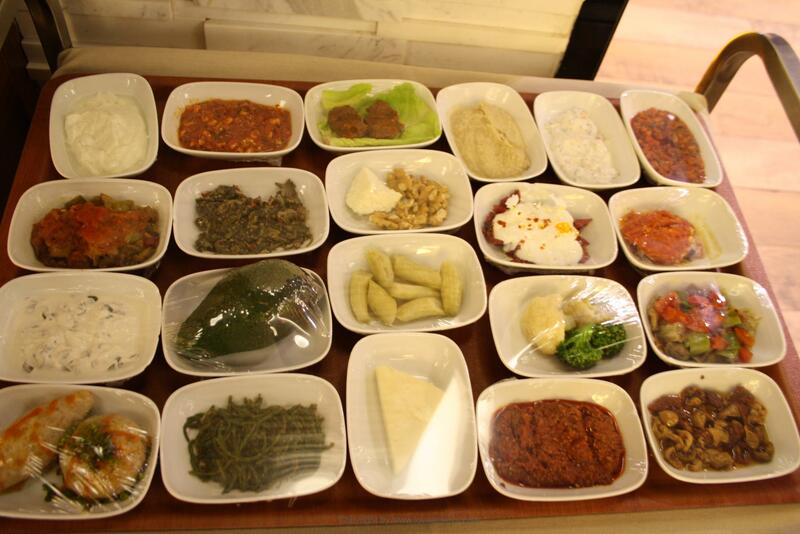 Turkish food is (for the most part) not very spicy or strong – although it obviously occurs in certain dishes. There are spices such as cumin, peppers and thyme used with tomato and pepper pasta. But what should you eat when you come to Turkey? Although there is amazingly much to taste (and really many variations of each dish) there are always some special things to try. There are things that you just have to taste when you are in Turkey. I have tried to make a list of the most important ones, so you might get an overview. Döner kebab: Döner kebab is a very broad term, but mainly covers meat that is barbecued on a rotating spear. You surely know it from home, where you can get “kebab” in all shades – beef or chicken, with or without spices (I do not like it with spices – such as coriander etc.). But real döner are pieces of meat, that are squeezed together in flakes on a spear with fat and onion. As it rotates (upright and hopefully over fire), the grease melts down the meat and helps to flavor. Even if you think you’ve tasted it at home, I can assure you, that it doesn’t taste anything like that in Turkey – it is much, much better in Turkey. Because they use lamb together with beef (or veal). Most countries doesn’t use lamb because it’s too expensive. And before you twist your nose, the lamb helps to give you the good taste, that you will forever miss, when you return home and embarrass yourself to frequent your local “Ali kebab maker”. You will onle be dissapointed hereafter. 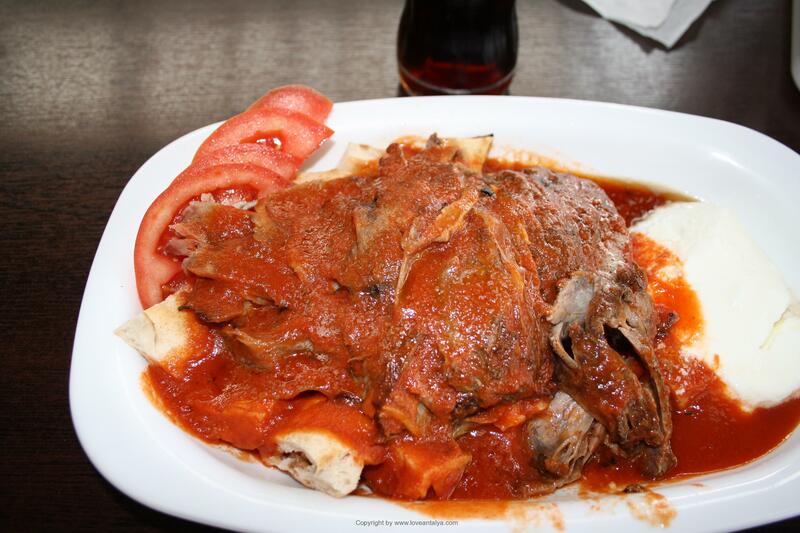 Iskender kebab: Kebab meat is placed on top of some fresh bread, poured over with tomato sauce and maybe a spicy butter and with a good portion of youghurt on the side. It may sound bizarre with meat, bread and youghurt, but it’s nothing less than world class. Delicious, delicious and delicious. In fact, you can find a recipe (which is probably not the same but as close as possible) right here. Köfte: also covers several different kinds of meatballs – with or without meat. Köfte is called many things in the world, so, for example, the terms Kofta and Keftedes cover almost the same. But common is that they contain a little spices, parsley, onion and garlic and are immensely lovely, greasy and delicious – especially if they are barbecued. Different recipes can be found here. 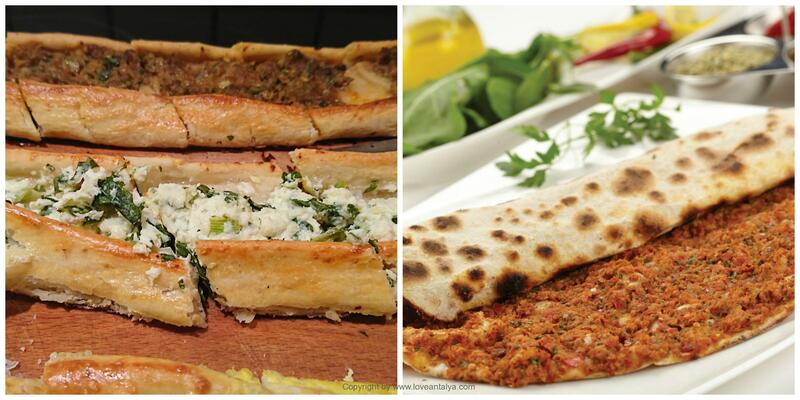 Pide and Lahmacun: It’s almost the same, only in different forms. Lahmacun is a round thin pizza-like thing with a thin layer of chopped meat (sauce), where you typically add parsley, lemon juice and maybe a little chili, roll it together and eat it like a pancake. Pide is served with a variety of filling – minced meat, meat in squares, different kinds of cheeses, Turkish spicy sausage called sucuk, egg, feta cheese, spinach, etc. Both parts are really beautiful, greasy and quite irresistible. 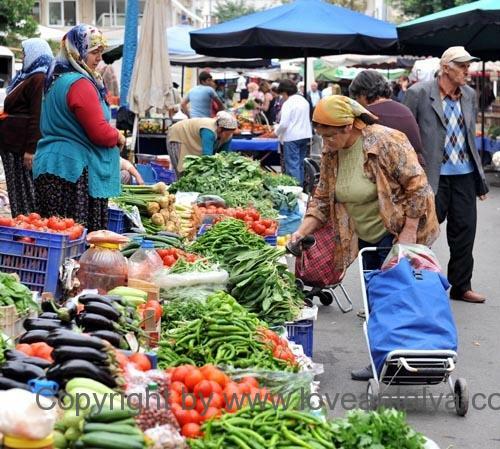 Soup: is also a big part of Turkish cuisine. Potato soup, chicken soup and tomato soup are popular though with a Turkish twist, but also the more ethnic youghurt soup, lentil soup, wedding, garlic or tarhane soup (where a special spice is used) is wildly popular and tastes immensely good. My clear favorite, however, is the slightly more spicy ezogelin soup, which reminds of a lentil soup, only with spices and bulgur. Meze: is one of the coolest things you can get if you want to hear my opinion. Always go after meze and use it as a kind of starter or lunch or even as pure main course. Meze is a term for several small different hot or cold dishes, like Spanish tapas, can be put together on a cross. There are dishes with beans, dishes with different grilled, pickled or marinated vegetables, with seafood etc. etc. You will definitely find something that you can like. Meze is often eaten with the alcoholic anise-tasting Raki to be mixed with water. Recipes for some of the great meze can be found here. Manti: is one of the things, that I’m absolutely crazy in love with (and always missing when I’m home). You can compare it with ravioli – a pasta-like thing filled with meat and with strong youghurt / garlic sauce over and a little melted butter with chili pepper. Really delicious. You can buy it in most ethnic stores, but can of course also make it yourself. Recipe follows here. Börek and Gözleme: reminds much about each other. They have in common, that it is made of very thin dough – yufka dough, where there are mushrooms, meat, mashed potatoes, cheese, spinach and the like (one thing only). Where börek is built up in the height and baked, gözleme is a sort of almost flat pancake filled and cooked on a pan. Really good food for example to bring along on the go. Bread, bread, bread: in different sizes and shapes. 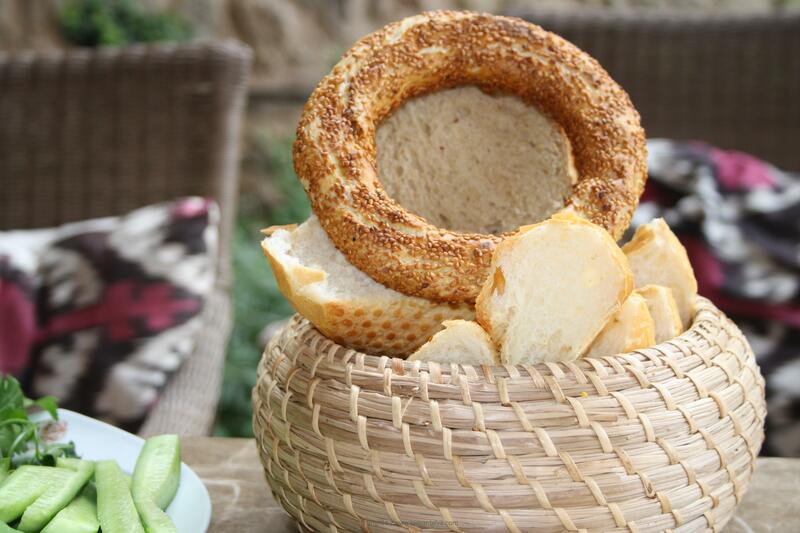 Many with a variety of fillings inside, but also plain bread such as the tasty white French bread, flatbread, the round seasons Simit, sold everywhere in the streets, different coarse bread, croissants and much more. Rice and Bulgur: You can hardly avoid eating a meal without being served either rice or bulgur. And, in fact, nothing really does matter, because both are furiously good. The rice is often served with some stuff added – such as the small Sehriye rice, makeroni, chickpeas, eggplant or anything else. 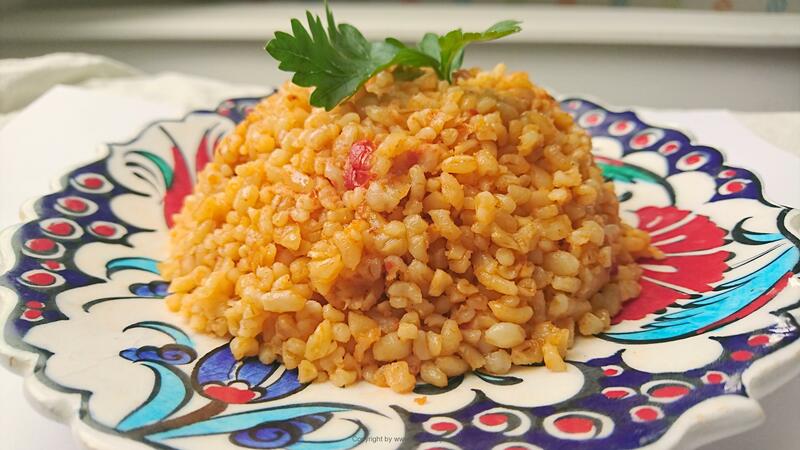 Bulgur is usually just plain tomato bulgur, like the one you can find the recipe for here. 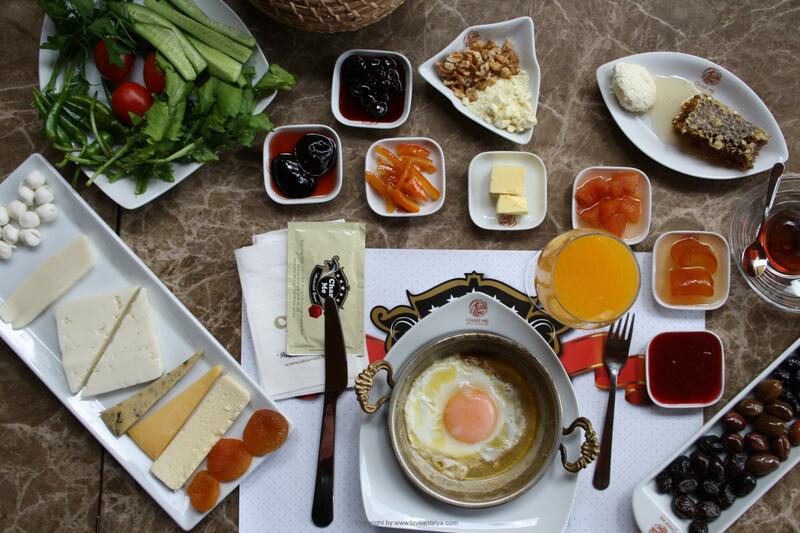 Turkish breakfast: never miss out on it. If you have it served the right place, it’s a really good brunch just with eggs, slices of sucuk sausage, tomatoes, olives, cucumber, marmalades, honey, pickled quince and orange peel, melon, cheese, bread and a lot of more. It’s a fairly comprehensive program so you need to have the appetite in order. Menemen also belong to Turkish breakfast. It is an intermediate between scrambled eggs and omelet. It is made of fried onions, pebbles and tomatoes poured over with light whipped eggs. The best breakfast I have ever had was at the Char Me Boutique Hotel in the middle of the city. It was the wildest, amazing breakfast table I have ever had. You can read about it if you follow the link. Tea and coffee: is mandatory. The coffee is made as baked coffee on a fire, while the tea must be at least as black and strong as the coffee (but with a good rind of sugar in). Everyone in our family loves Turkish tea and loves it at all times of the day. 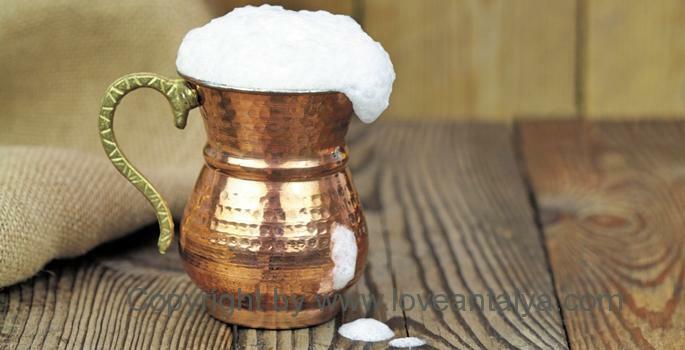 Ayran: is a beverage that is primarily made of buttermilk and salt and whipped up so it is frothy and ice cold. Really delicious and refreshing on a hot day. Sütlac: is a baked dessert made of milk, rice and sugar, almost as you know it from eg creme brulee. Right neutral but very good. And finally, we come to Baklava and Lokum (turkish delight): the two most popular desserts. Baklava is typically made from thinly baked yufka with nuts and lots of sugar and syrup. Lokum is made of rose water, lemon and a form of resin, possibly mixed with nuts or spices and rolled in flour. I’m not a fan of any of them, but many others are. and of course, you can not escape fruit in all shades – especially different kinds of melons, cherries, strawberries, grapes, peaches, apricots, plums etc. I do not have to say that it tastes sensational, when it’s ripe under the sun and is not transported for weeks in the back of a truck. 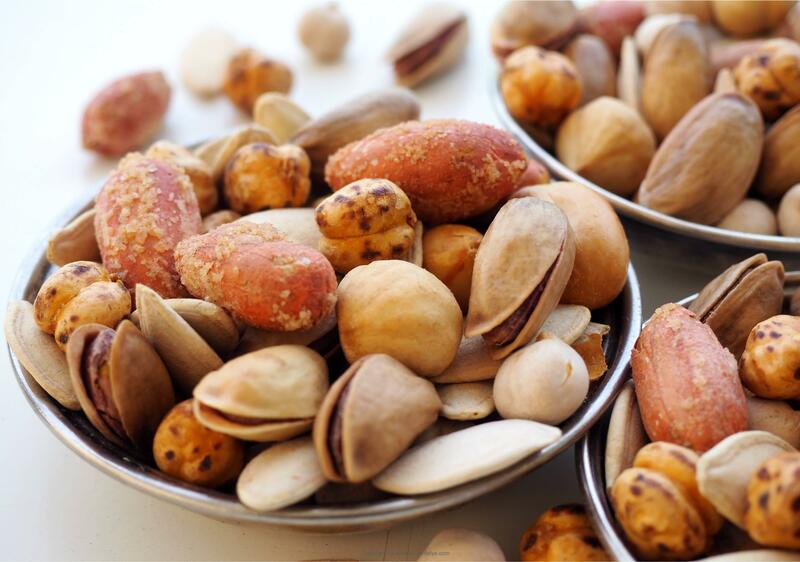 Nuts and kernels: also fills a lot within Turkish cuisine. They are used in everything from salads to special desserts and as a snack. 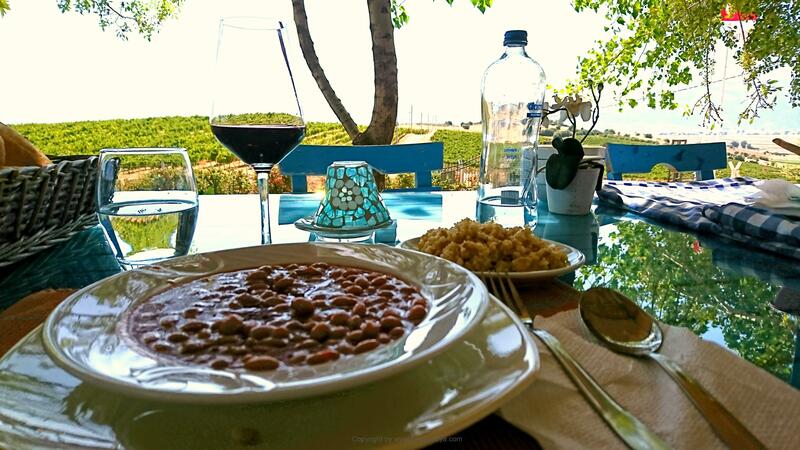 In all coffee houses and after larger dinners, in cafes etc you have the opportunity to have a small bowl of nuts, sunflowers, dried chickpeas, chickpeas rolled in sugar, etc. I love it. Especially because the nuts are so fresh and tasteful.